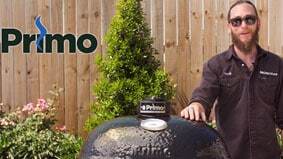 Keep moisture and the elements away from your Primo grill with a premium Primo cover. These covers are designed specifically for your Primo grill based on size, shape, and type. You can expect a perfect fit and great protection from nature while using Primo factory branded covers. Crafted with durable vinyl, these covers are available for both built-in and freestanding grills. Primo heavy-duty covers are available in a variety of sizes – including the popular Primo XL grill covers for the Oval G420C and Oval XL models. Covering your Primo grill is an easy way to keep your grill looking great and in excellent condition for many years to come.